Chicken and Butternut Squash with Coconut Cream Sauce! This easy and healthy one-pan Indian-inspired dish is seasoned with warm spices like coriander and nutmeg. Today I’m sharing a super delicious, healthy, and easy dish that can be on the table in 30 minutes! 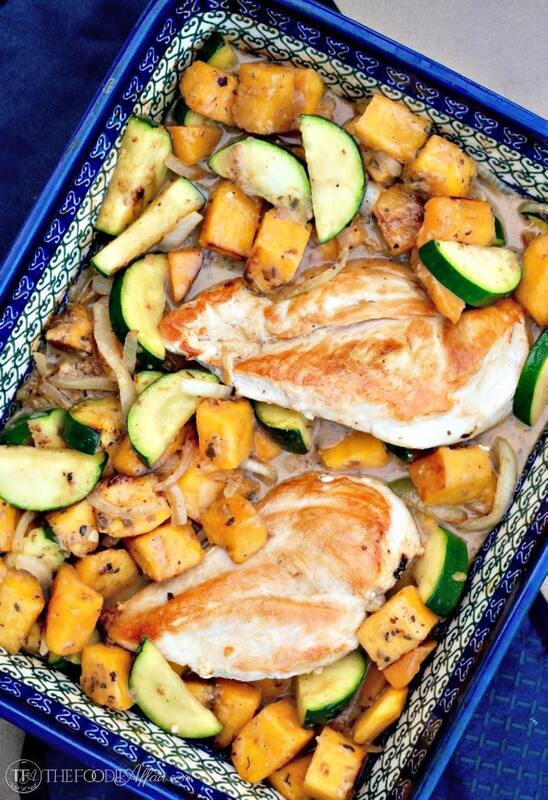 This one-pan chicken and butternut squash dish is the perfect amount for a couple. Actually, there is more than enough veggies that were leftover for another meal which we turned into brunch! Fry up an egg and layer it on top and you have transformed this dish into another tasty meal! All the ingredients in this dish are nutritious and filling. You’ll get plenty of fiber from the butternut squash, a good amount of protein from the chicken and a nice dose of healthy fat from the coconut milk. Pretty much perfect combination of nutrients. The coconut sauce with the sweet squash and onions is simple and tasty! In fact, once the sauce melds with the spices you could practically spoon it up and eat it as a soup! Deglaze the browned food residue from the skillet! Here’s a handy tip for you! After the chicken has been seared and the veggies sautéed be sure to scrape the bottom of the pan when you add the liquid to the skillet. Deglazing the pan ensures you get those leftover bits to add even more flavor to this meal. Unfortunately, I was running out of sunshine when I took these photos, so I missed a good close up of the sauce. You can kind of see that the sauce turned a light tan color like cream of mushroom soup. Interested in more casserole meals? Give these a try! Unstuffed Bell Pepper Casserole – all the classic flavors of a stuffed bell pepper, but this is a low carb no-fuss version! Easy Chicken and Broccoli Casserole – made with an easy homemade mushroom soup. This tasty recipe is made and served in the same skillet! Low Carb Hamburger Casserole – made with cauliflower instead of pasta. This dish is seasoned with the same spices you use for tacos and topped with CHEESE! Chicken with vegetables covered in a light coconut cream sauce is a quick meal ready in under 30 minutes. Heat a large oven proof skillet with 1 tablespoon of oil over medium high heat. Add chicken and sear each side for 3-4 minutes. Remove from pan and set aside. Add the remaining oil and saute onion and butternut squash for about 5 minutes. Add sage, coriander, nutmeg and zucchini. Saute for an additional 3 minutes. Add coconut milk and cornstarch mixed with water. Scrape brown bits from the bottom of the skillet as you stir in milk mixture. Add chicken back to pan and cover. Place in oven and bake for 15-20 minutes or until vegetables are tender. OR place all ingredients in a small oven proof casserole dish cover with foil and bake the same as the skillet option. I am absolutely adding this meal to my menu for next week. It sounds so tasty, especially that sauce! 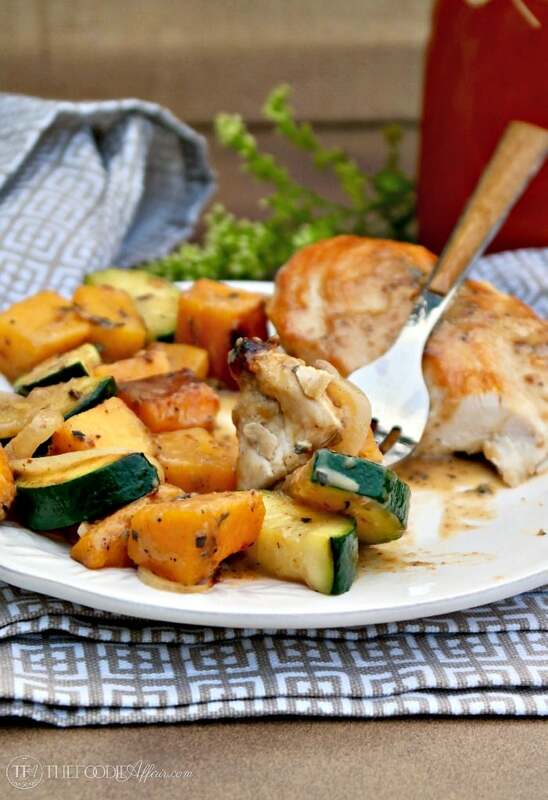 This coconut cream sauce sounds delicious over the squash. This looks so good! I’m definitely pinning this so I can add it to my meal plan! Thank you! This sounds like the perfect weeknight meal! I love butternut squash (or any squash) and am always trying to find new ways to cook it. This look so yummy, I am definitely giving this a trial. Thanks for sharing! Oh my this looks so good! chicken is my fav!! I will have to try this recipe. This dish looks out of this world and certainly pinning this recipe to my Chicken Bizillion ways! Actually I have everything to make this dish for dinner- brilliant idea for supper. Thank you, Bobbie! I’ve been dreaming of your carrot recipe and will be making it over the weekend. This looks delicious!! Straight out of a magazine. Pinning now. Yum! This looks delicious! I love butternut squash! One of the best veggies ever! 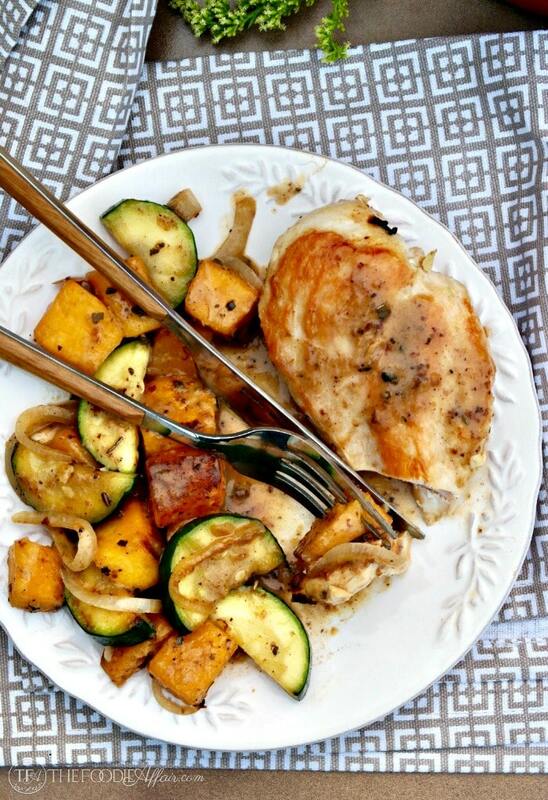 This looks like the perfect fall dinner and I always love finding new ways to cook and serve chicken! Wow…this dish looks incredible! I love all of these ingredients and can hardly believe it’s a meal I don’t have to save for my “Cheat Day”! So looking forward to trying this. YUM! This looks amazing! I can’t wait to make it for my family! Thanks Chrissy! I was so happy with the results and thrilled to have a bit left for brunch! That looks deelish! I am a HUGE squash lover! I’m right there with you! Squash is pretty much a staple at my house. This dish looks so good. 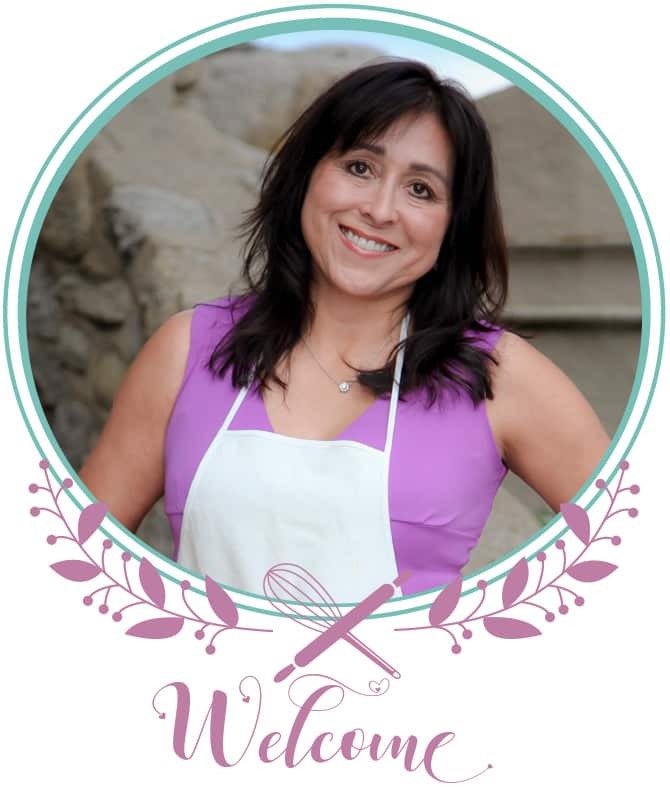 I pinned to cook for next week. I love cooking with squash and coconut milk. Thanks for sharing. What a lovely dinner! 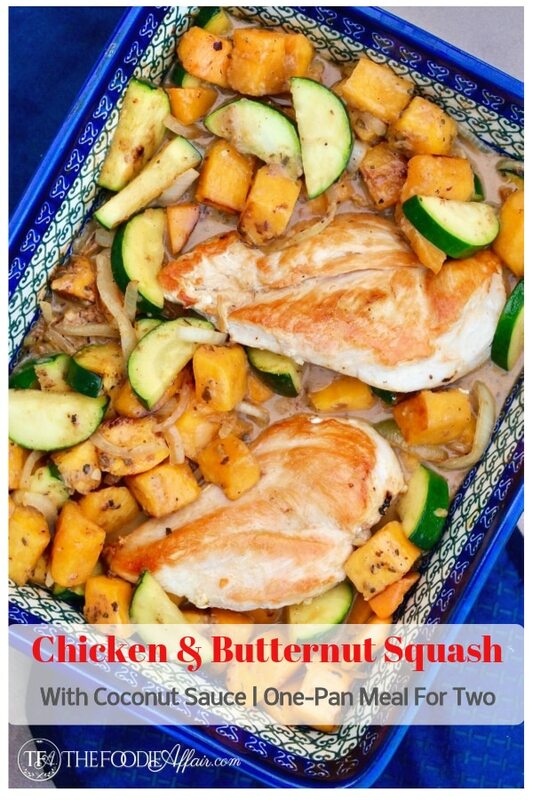 I love butternut squash, and the coconut cream sounds so flavorful and great! I would love that plate sitting in front of me. It looks delicious! What a great healthy meal. I love the combo of butternut squash and zucchini. The seasoning of the sauce sounds spectacular! 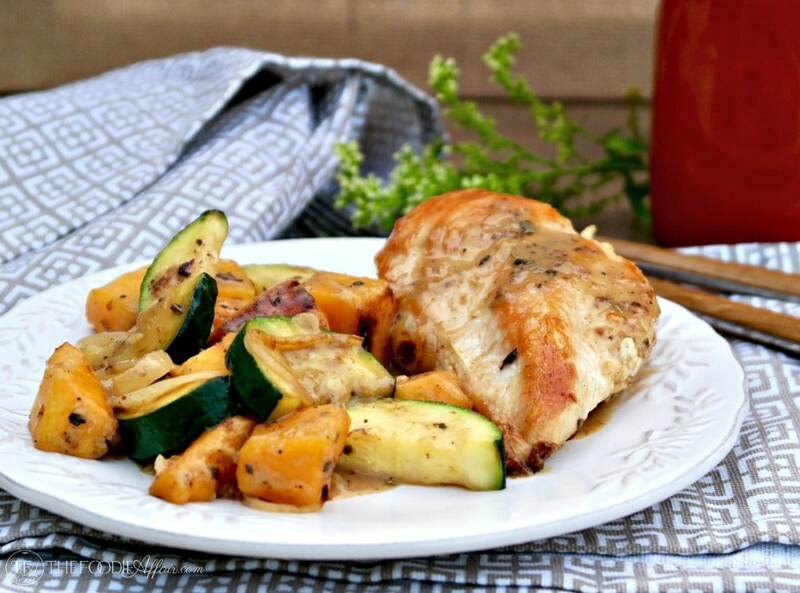 This is a wonderful and complete meal; we love the health and fresh seasonal taste of this dish! This dinner has my mouth watering! I have to try it! This recipe is right up my alley and perfect for a busy weeknight! This is definitely right up my alley…I love the flavor of coconut milk! Can’t wait to try this, Sandra! What a beautiful dish for fall! Totally digging all of this! My kids will flip for that sauce! 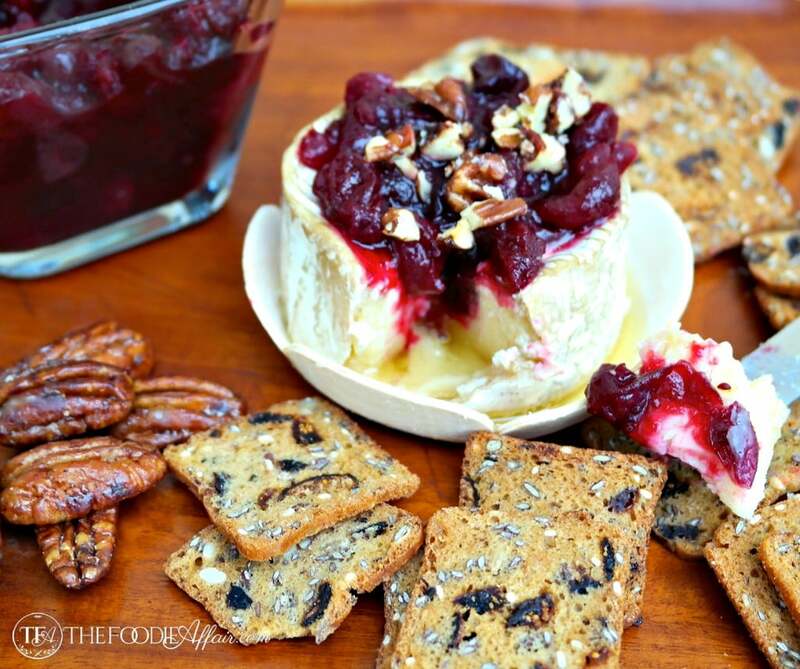 I’m loving this recipe for fall…can’t wait to try it. This looks absolutely delicious! Such a beautiful meal! Love that cream sauce and the fall squash. Coriander and nutmeg are two of my favorite spices! I would like the nutritional values per serving so I can plan the amount of net carbs for the day. Hi Deborah! Thanks for stopping by. I haven’t looked up the macros for this dish yet, but you can easily put in the ingredients to a recipe analyzer like My Fitness Pal Recipe Analyzer.